Persistent barriers to work are creating brain waste, serving as a loss for employers, society and refugees themselves. 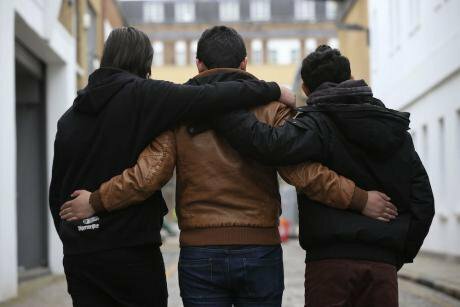 Syrian refugees (who cannot be identified for legal reasons) at a charity in London after they arrived from Calais to the UK via the Safe Passage legal route. Jonathan Brady/Press Association. All rights reserved.More must be done to help refugees into work. That was the verdict of the recent UNHCR study into the UK’s efforts to integrate Syrian refugees. No one feels this more than ‘Rahim.’ He worked for 20 years as a mechanical engineer in Sudan only to find himself rummaging through bins in London for food. He often wonders how he’ll rebuild his life after arriving on the shores of Europe with nothing but his life spared and his family thousands of miles away. ‘I am trying to forget it’, he tells us, quietly. We are there to ask Rahim about his job prospects and the support he’s getting from a flagship programme run by Renaisi, RISE (Refugees Into Sustainable Employment), but this now appears trivial given how much he’s already overcome just to be here, sat in front of us, and articulating his story with quiet dignity and calm. Like so many other refugees in London, Rahim is highly skilled yet struggling to find work. Like so many other refugees in London, Rahim is highly skilled yet struggling to find work. It’s a familiar tale of unemployment, of underemployment, of tacit experience which Rahim has yet to master, and of untapped skills and potential. Employment is the most significant factor favouring long-term integration of refugees and critical for the journey towards belonging, and yet significant barriers remain. A lack of clarity over working rights and a lack of recognition of refugees’ qualifications can deter employers from hiring refugees. As well as this, many refugees have fled for their life, and are likely to be traumatised from what they have seen and been through. They may not speak English and usually have to navigate an entirely different culture and labour market from their homeland, often facing discrimination along the way. RISE sources some great jobs from innovative initiatives such as the Breaking Barriers programme but as we continue to talk to these refugees about their circumstances, it strikes us that the challenge is much more than just finding jobs; it is also about providing language support, building confidence, sourcing affordable childcare and dealing with mental health issues associated with trauma. RISE offers support for all these issues but more often than not, the programme also has to overcome issues of homelessness and destitution before any refugee can even consider discussing employment and training. In short, what is required is a holistic package of support to meet refugees’ needs, of which employment support is just one element. More often than not, the programme also has to overcome issues of homelessness and destitution before any refugee can even consider discussing employment and training. For refugees, too, employment represents much more than just finding a job – something that’s arguably much easier to do these days thanks to the likes of Uber and Deliveroo. Refugees want to work to become self-sufficient and to re-build their lives. In this sense, finding employment is about more than just financial security; it also provides a sense of self-worth, the opportunity to deploy hard-earned skills and qualifications, and to widen one’s social connections. While headlines of bogus asylum seekers and welfare tourism could lead you to believe that refugees want a free ride, nothing could be further from the truth. Rahim wants nothing more than to apply his skills and work as mechanical engineer, but he’s had little luck with employers who don’t value his Sudanese experience. Employers also have much to gain from hiring refugees beyond that of just filling vacancies. Aside from the diverse experience and skills that refugees bring, they are also highly motivated and have a strong work ethic. In a recent survey of over 2,000 employers in Germany, more than three out of four employers who had hired refugees reported few or no difficulties with them in daily work, and 80% were broadly or fully satisfied with their work. For him, being able to meaningfully participate and contribute to his local community is as important to his well-being and self-worth as finding paid work. Persistent barriers to work are creating brain waste, serving as a loss for employers, society and refugees themselves. From Lord Dubs to Sigmund Freud, people who are given the opportunity to rebuild their lives, often from terrible circumstances, grab the opportunity with both hands and go on to make huge contributions to their country. Sir Mo Farah arrived in the UK with almost no English; we have recently seen him knighted for his services to athletics. With these examples in mind, and with the threat of post-Brexit skill and labour shortages looming, shouldn’t we be asking what more this country could be doing to help newcomers realise their potential? Indeed, shouldn’t we be asking what more can be done to help all British communities who are struggling to access the employment opportunities that they deserve? The Mayor of London is the latest person to call for us to redefine integration policy as one that concerns the economic success of ‘All of Us’ and not just particular racial, ethnic or migrant groups, who then tend to be ‘problematised’ in popular debates. Indeed, shouldn’t we be asking what more can be done to help all British communities who are struggling to access the employment opportunities that they deserve? Conceptualising integration in this way is not incompatible with a recognition that refugees face particularly entrenched barriers to work. Initiatives such as RISE are vital in addressing some of these barriers because refugees often require a much broader package of joined-up and coordinated support which go beyond employment and training. Mental health services, housing and childcare provision (to name just a few) are all critical in underpinning and enabling sustainable work for refugees. And while recent cuts to many of these services may have undermined the prospects for a more coordinated response to refugee integration in the UK, there is promising work, gaining momentum in Europe, which offers plenty of inspiration. The Danish, Swedish and German governments are all working closely with social partners and employers to proactively improve the labour market integration of refugees. Meanwhile, the European Commission has launched Employers together for integration, a high-profile initiative designed to give visibility to the work that employers are doing to support the integration of refugees and other migrants into the labour market. What would it mean for the UK to follow suit? It would mean acknowledging that refugees have a right to be here and the right to fully participate in our society to support themselves and their families. It would mean supporting their right to be employed and use their skills and experience because that investment will be repaid many times over. It would also mean recognition of the fact that, for many refugees, employment is about more than just having a job; it is an opportunity to rebuild a life. RISE (Refugees into Sustainable Employment) is supported through the Building Better Opportunities (BBO) programme, which is funded by the Big Lottery Fund and European Social Fund (ESF).